﻿PORTALS provides the highest quality of craftsmanship ﻿to preserve the integrity of historic wood windows and doors while ensuring optimal functionality and energy efficiency. 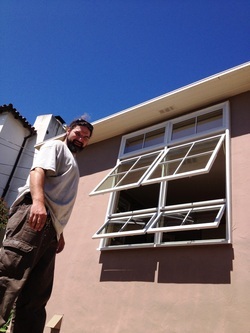 With over 15 years of professional experience, I specialize in WOOD WINDOW & DOOR RESTORATION & REPLACEMENT. ﻿Restoring ﻿the look and functionality to historic wood windows and doors is more than just a job at PORTALS Wood Window & Door. It is a passion and work ethic out of true love. Helping others while maintaining our environment, community, and cultural heritage is a privilege I take great pride and enjoyment in. My core values guide the work, whether I'm tuning up a sticky old double-hung or preserving every window in your home with historically replicated replacements. Originally crafted wood windows and doors can function in historic buildings for 100+ years with proper maintenance. This is a testament to the quality of the craftsmanship and materials that went into this original work. At PORTALS Wood Window & Door, it is my mission to maintain and provide the same highest standards of quality and craftsmanship. I believe strongly in being a good steward of both our cultural heritage and the environment. As a family we are always trying to protect the natural world and support a belief in green sustainable living. I enjoy helping my clients meet the unique needs of their home in ways that work for them and their budgets. My goal is to provide a service that is second to none in the business. A C-17 contractor's glazing license from the California Department of Consumer Affairs Contractor's State License Board ensures my customers a licensed, professional, and high quality craftsman.